Jacques Laurent Agasse is surely the most accomplished painter of animals that Switzerland has ever produced, and amongst the most refined painter of such paintings to work in England. He lived in London for the last 50 years of his life. His paintings are of the utmost technical refinement and delicacy, and are superbly observed and drawn. 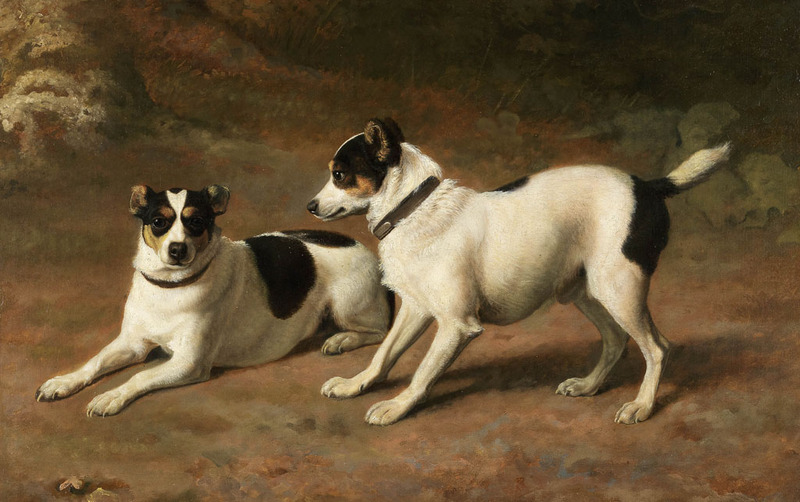 It is a tribute to his quality as an artist that in the past many of his paintings have erroneously been attributed to George Stubbs, the only other painter of the Georgian era who matches or surpasses his achievements. Agasse was born in Geneva on 24th March 1767, the son of a prosperous Huguenot immigrant family. His childhood was exceptionally happy, spent between the family's houses in town and country: in the latter he spent much of his time in the stables, kennels and farm-yard. After discovering an edition of Buffon's Natural History, he started to copy pictures of animals, at which he rapidly became proficient. His father enrolled him in the Calabri Academy of Drawing in 1782, where he struck up friendships with Firmin Massot and Adam Toepffer, and collaborated in painting a number of works with them. From 1786-9 he moved to Paris where he worked as a pupil and assistant in David's studio; his stay was brought to a close by the onset of the French Revolution, which had the effect of ruining his parents' business. Back in Geneva, he met (1789) and was encouraged by the aesthete, courtier and sportsman George Pitt, later Lord Rivers, who advised him to try to earn his fortune in England. He stayed in Switzerland, though, for another decade, before arriving in England, via a second stay in Paris, in 1800. Here he stayed with the family of his Genevan friends the Chalons, who had established themselves as successful artists in London. In the following year he exhibited his first painting at the Royal Academy, a pattern which repeated itself throughout his long (49 years) stay in London. Agasse's life in London was marked by a great success as an animal painter, and his patrons included such luminaries as Lords Wellesley and Rivers, the Royal; Collection and many other grand landed families. He made something of a speciality in painting exotic animals, and was a frequent visitor to the menageries which were such a feature of London Life at this date. He died on 17th December 1849 and was buried in St. John's Wood.